A festive tradition for the whole family, the timeless classic The Nutcracker is broadcast live from the Bolshoi stage for two hours of enchantment and magic on 23 December 2018. On Christmas Eve, Marie’s Nutcracker doll magically transforms into a prince taking them both on a wonderful adventure. 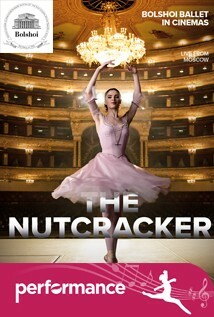 Along with Tchaikovsky’s cherished score, Yuri Grigorovich’s choreography, the Bolshoi’s Principals, Soloists and the accomplished Bolshoi corps de ballet this promises to be the perfect pre-Christmas treat for the whole family. Taking audiences of all ages on a magical journey through a world of enchantment complete with dancing snowflakes and dolls that have come to life, accompanied by Tchaikovsky’s beloved score. Once again audiences have the opportunity of also seeing or choosing the Royal Ballet’s production earlier on 9th December. 140m approx including interval.